We loved this recipe from Martha Stewart’s “Great Food Fast” cookbook! 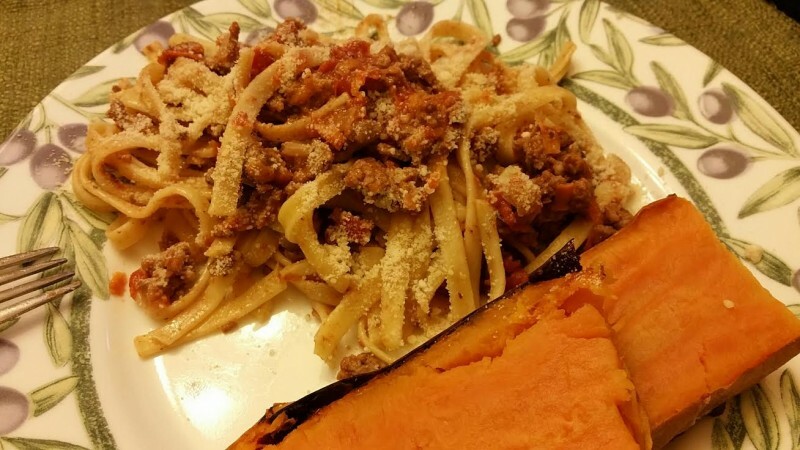 It’s a perfect recipe when you want a homemade meat sauce to go with your pasta and want to avoid a jarred sauce. It reminded us of the flavors of the Greek dish called Pastichio, but it was infinitely easier to make! The secret ingredient is shredded carrot and most people would never know! This was a quick recipe and could be made even on a week night. This recipe includes milk, which channels Northern Italian recipes like that of the famed Ragu alla Bolognese. The only change I made was that I used about 1/3 of an onion instead of a whole onion, so I decreased the butter to 2 tablespoons and used the 1 tablespoon olive oil as instructed. I probably could have decreased the butter to 1 tablespoon looking back, because it left a little oil/butter residue. Very yummy dish! *We used a little over 3/4 LB. of lean ground beef (90%). Next time I’d use a full pound. Heat the butter and oil in a large saucepan over medium heat. Stir in the grated carrot, onion, and garlic. Cook a few minutes. Add the ground beef and cook until it turns from pink to brown, about 5 minutes. Add the tomatoes and their liquid, crushing them with the back of a large spoon. Stir in the milk, bay leaf, thyme, nutmeg, 1/2 tsp. salt, and 1/8 tsp pepper. Simmer for 20 minutes. Then discard bay leaf. Meanwhile, in a large pot of boiling salted water, cook the fettuccine until al dente according to the package directions. Reserve about 1/2 cup of the cooking water, and drain the fettuccine. Return the pasta to the warm pot. Add the meat sauce to the pasta, and toss. Add the reserved pasta water as needed if the sauce seems dry. (I ended up adding maybe 1/4 cup to make it moister).